The classes that make up the connector that accesses the database schema metadata exposed by JDBC drivers for existing relational databases. MetadataCollector The MetadataCollector provides hooks for DBMS-specific implementations of metadata retrieval methods. ColumnMetadata Container for column-level metadata. JdbcMetadataCollector Default MetadataCollector implementation that uses the built-in JDBC support for collecting database metadata. 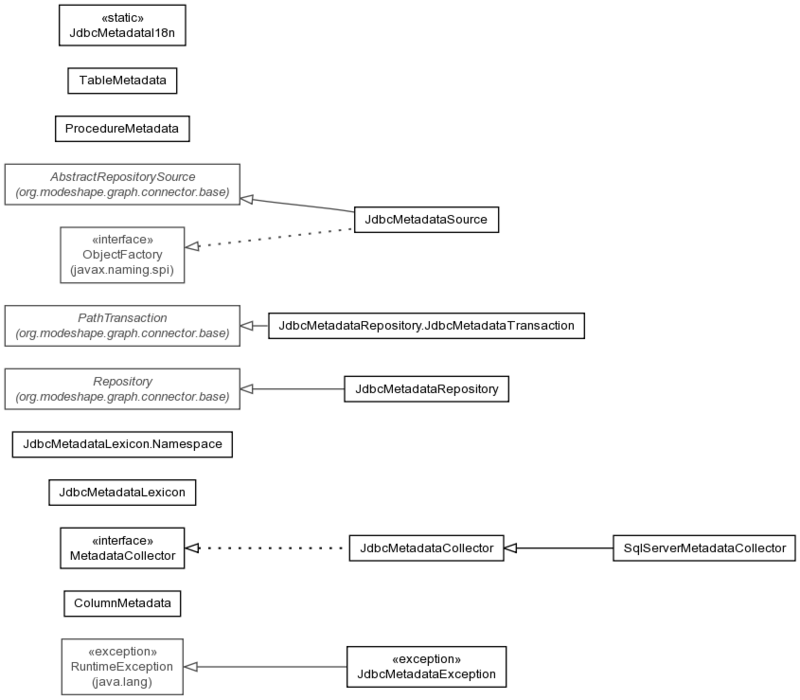 JdbcMetadataI18n The internationalized string constants for the org.modeshape.connector.meta.jdbc. JdbcMetadataLexicon The namespace and property names used within a JdbcMetadataSource to store internal information. ProcedureMetadata Container for column-level metadata. SqlServerMetadataCollector The Microsoft SQL Server JDBC drivers return a list of users from the DatabaseMetaData.getSchemas() method instead of the actual schemas. TableMetadata Container for table-level metadata.